Monday, May 14 - Amsterdam, Amsterdam, Amsterdam! So class, please take your seats and pay attention! Today we learn a little about Amsterdam and Holland and the Netherlands. The Netherlands is made up of 10 provinces, two of those being North and South Holland. These two, together are known as Holland. Holland is often used when referring to the Netherlands in total. The capital of North Holland is Haarlem, the capital of South Holland is Amsterdam. The capital of the Netherlands is Amsterdam. Class, are you paying attention? We learned this ourselves when speaking with a kind lady in a Blue Delft store in Amsterdam on Monday. We spend almost the entire day in Amsterdam. By the way, we must give a great shout out to our daughter Candace who is helping us with this blog. It has already become very difficult to add images and text blocks to the blog from over here, but oddly enough we can upload photos very quickly to the internet. So, Candace is helping us with the building of the blog and we will provide the details. So here we go on our tour for Monday. And what a tour it was! This street view is to be found in many, many places in Amsterdam - a narrow street with building seeming (an in many cases actually) leaning towards each other, with some spire in the distance. I do not know which church this was, but we have seen many that are no longer churches. As the population abandoned the churches, they were turned into museums or breweries, or used for other purposes. We found this to be pretty sad, and others on our tour expressed the same thought. After a short walk in Amsterdam, we found ourselves in the great square in front of the royal palace of Amsterdam. It is where the king of Amsterdam lives. I mean in the palace, not the square! We were given about an hour of free time before we had to rejoin our group to continue our walking tour. So, we took a few more photos (by the end of the day it was almost 180), found a bathroom for one of us, and found some coffee for one of us, and then we returned to meet our group. Then we were on our way to our canal tour! 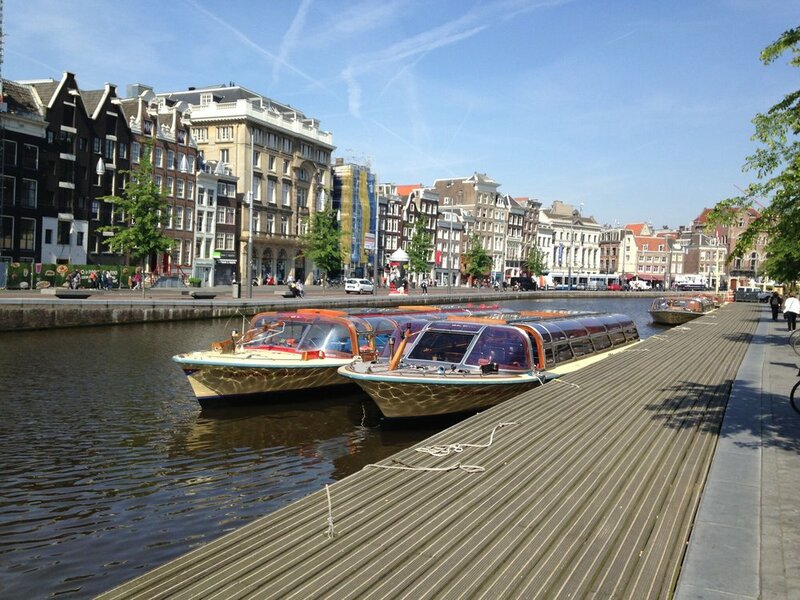 Amsterdam has over 100 canals and over 1000 bridges, so it just makes sense to take a tour of the city by boat. This was quite enjoyable and we saw many sites from the comfort of our boat We were the last to board and all the other tour members skipped the first seat, so when we boarded, we sat right up front behind the captain! I mentioned earlier that it seems that the houses lean toward each other. That is true and it is intentional. At least for them leaning forward. At the peaks of their roofs is an extended arm with a pulley. The buildings were better able to offload goods from ships in the canals because of their leaning forward. Also, taxes were charged based on the width of the front of your house or business, so making them narrow and very tall was the way to go. Of course, moving furniture up stairs in such a narrow house is very difficult, so the pulleys are used to hoist large items up and in through a window! We were told that fries are all the rage with the folks in Amsterdam. We had a pretty good breakfast at our hotel this morning, so we didn't need a full lunch when we were released to find lunch on our own. So, we thought we'd try the fries that the locals are so crazy about. They're just fries! They do have about 30 different sauces you can get for them (ketchup is on the list, but not at the top, that's mayonnaise (yuck!) But the fries are just fries. Very much like those at Wendy's, though sometimes larger. Well, after our trip to the 1 Euro toilet, we enjoyed our fries and a Coke. Then back to meet the group! But wait, what is that in the window? Meringue! A sweet shop with big cookies made of meringue! Now, Dean's mom and daughter can both make a mean meringue, but this was not like that. Theirs is soft and fluffy, and usually found on top of a scrumptious piece of pie, but this was a hard meringue cookie. They had all sorts of flavors as the image shows. We got a lemon one, which we could only barely tell was lemon. But it was good, though very dusty as we crunched it away! Of course, many know that Holland is known for its tulips, bulbs, and flowers. As we walked along one of the canals, there were thousands, probably millions of flowers and bulbs for sale at the canal-side vendors. They were beautiful! We didn't get any. No room in our luggage! Next stop - the Rijksmuseum (pronounced the Rikes Museum). We are not anti-art. We're not. But we also are not educated enough about art to really appreciate it. Well, that's not really as true now as it was before we went here. We had another local guide, Mary Ann, to take us through the Rijksmuseum and show and tell us about what we saw. She was great! We learned much about early art in Haarlem, about the art of Rembrandt, about lighting and shading, and how to see details in the paintings. At the end of the tour (after we almost ran from the main area of the tour, through back shortcuts to the other side of the museum to see two related works, then ran back to meet our group as we were leaving), three or four of the ladies in our group were talking with MaryAnn and got very teary-eyed as they talked with her about the tour, about her passion for the art in this museum. This was a real highlight of our day. We both have a much more informed appreciation for art. Thank you MaryAnn! The above is a self portrait by Rembrandt in his later life, not long before he died. MaryAnn shared with us the difficulties he had in his life as well as information about the paintings he did. Though we didn't have to, we took many pictures in the Rijksmuseum. Why didn't we have to? Because they have them all available in high quality for download from their website, for free! Once we return home, I'm sure I'll be downloading some of them. We spent a good deal of time looking at and learning about many of them, but a favorite was the Night Watch. Check it out online! One of the last things MaryAnn showed us in the Rijksmuseum was the doll houses. These were not toys, but serious collections of miniatures by the fine women of the day. They could be very elaborate, and very expensive! After a very busy day in Amsterdam, we rode the tram back to the train station, and the train back to Haarlem where we went for pizza with four other travelers. The pizza was great! We stumbled into bed well after 11PM local time, having walked over 14,200 steps (6.2 miles). We're getting a real work out on our tour, and we're loving it! Thank you Candace for helping us with this blog!